The last time we saw Bette Sans Sousi aka Plastique on the small screen she was played by Jessica Parker Kennedy in Smallville season 10’s “Shield” as part of the Suicide Squad. In The Flash universe she is played by Kelly Frye a former bombs expert in the military. Bette has broken into a building to steal a file and when she goes to escape, she uses her backpack as a bomb and it goes off allowing her to get away. Barry, Iris, Eddie and Team Flash (minus Dr. Wells) are out drinking at a local bar, where Barry realizes that he can’t get drunk, when Eddie gets the call about the bombing. Eddie goes to leave and Barry too. When the Flash arrives he sees that a window washer is about to fall to his death and asks Cisco and Caitlin how fast he needs to go to run up the side of a building. I question the wisdom of having this conversation on speaker phone. Regardless, the Flash saves the man but who is also there? Iris who catches a glimpse of the Flash but can’t see his face as Barry moves it fast enough. As the Central City Police investigate, Barry manages to locate a file that helps their case but back at the precinct find ouf from Captain Singh that the army led by General Wade Eiling is taking over the case as it involves one of its own. Wells has history with Eiling as they were working together to create super soldiers that involve mind reading. It was the latter that caused Wells to break ties with Eiling. When Team Flash find a possible address where Bette could be, Barry suits up and goes there but when he confronts her Bette, she touches the emblem on his suit that we notice starts to turn purple. Bette warns Barry that he needs to get out of his suit or he will explode. Barry gets out of the suit in the nick of time. Cisco is quite upset that Bette destroyed the suit but can’t stay mad for long when he sees what Bette looks like. Team Flash realizes that Bette is after a military doctor that operated on her several times so Barry goes there and as Eiling and his men come upon them, a sniper does hit Bette. 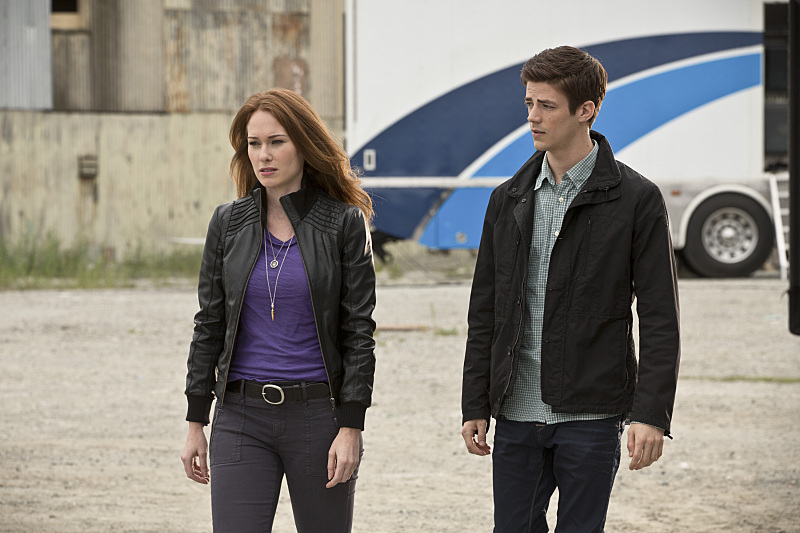 Before they can retrieve her, Barry rescues her and takes her to STAR Labs. We learn that Bette was in Afghanistan and was involved in an explosion and under went several operations to remove shrapnel in her body. When the particle accelerator explosion happened, Caitlin theorizes that the explosive shrapnel in her body caused her powers. Eiling realized what Bette could do and wanted to use her as a weapon in the war. Bette learns that she and Barry are the only two meta humans that STAR Labs have tested. As they are testing Bette, Caitlin notices that a tracker in her and Eiling and his men descend STAR Labs. With Bette in hiding, Wells doesn’t give Bette up so Eiling leaves empty-handed. I should point out that Cisco has developed quite the crush on Bette and is saddened to when Caitlin gives her some bad news that the shrapnel in her body has become part of her DNA and they can’t separate it. When Bette is alone, Wells gives an analogy how people in the military are called sheepdogs meaning they go into protective mode when their flock is in danger. Wells says that people like her and Barry are being threatened by the likes of Eiling who want stop hunting them down and orders her to kill Eiling and his men. So Bette confronts Eiling along the waterfront but she throws some explosive marbles in their way that takes them down. When Barry wonders where Bette went, Wells lies but Cisco manages to hack into military satellites to find her. Barry comes on the scene and tries to talk Bette down but Eiling shoots Bette, killing her. Before Bette dies, she tries to tell Barry that Wells was the one that ordered her to kill Eiling. Bette starts to glow and Barry knows she is going to blow up. Barry wonders if he can run on water and after getting what speed he needs to go, he grabs Bette and runs along the water to drop Bette’s body in so when she explodes, he and the rest of Central City are safe. I find it hard to believe that Bette is dead considering that Plastique is a significant villain in the DC Comics universe. I was expecting to see Bette emerge in the post credit scene but alas that didn’t happen. More on the post credit scene later. With Iris tonight, Joe is upset that Iris was at the scene of the bombing but Iris defends being there because she wanted to see the Streak and write about him because he is helping the city. Joe then asks Barry to talk to Iris about getting her to stop writing about him, When Barry does, Iris is incredulous because she supported his belief in the impossible and when the impossible is in Central City, Barry doesn’t support her. Barry then mentions that she writes about the Streak without signing her name to the articles. So the next article that Iris writes has her name in the by line, a fact that Joe points out to Barry. When Barry lets Cisco know what’s up, they know it is not good news as the believe Iris will become a target to get to him. So Barry as the Flash visits Iris at Jitters. Barry uses some voice modulator to get her to stop writing up him and refuses to answer any of her questions, Iris then tells the Streak that she is writing about him to help Barry that the impossible is out there. It seems that Iris might be smitten with the Flash as indicated by her body language when he was approaching her. Their rooftop meeting totally reminded me of all the times that the Blur and Lois talked to each other in Smallville during seasons 8 and 9 before Lois found out the truth. When Barry meets Joe later at his lab, he shares that he moved his vocal cords real fast to change his voice and tells Joe that Iris is writing about his alter ego for him. Joe realizes that Barry wants to tell Iris about him that he tells her everything. Joe points out not everything. Barry realizes that Joe knows that he is in love with Iris. Joe has been waiting for Barry to say something to Iris. Barry realizes that he is too late. Later, when the events with Bette are over, Barry visits Iris at her home and tries again to get her to stop writing about the Streak. Iris wants to know why Barry won’t support her. Barry says that he has put what happened to his family behind him and she should to. Iris won’t and she will keep on writing about the Streak until people believe in him too. Barry says that perhaps they should stop hanging out for a while and it seems that Iris needs to accept that. When Joe returns home, he sees that Iris is still writing about the Streak and starts to talk about it but she won’t hear it and we see that she is upset in the fracture of her friendship with Barry. Barry is trying to drown his sorrows at the bar but is just drinking club soda. Caitlin and Cisco join him and she gives Barry a drink she came up with that would allow him to feel a buzz. It does but only for a few seconds but the three continue to drink together. In the post credit scenes, Eiling visits Wells at STAR Labs and mentions that he saw the Streak and wants to work together again. Wells refuses and threats are exchanged and Eiling leaves. We flashback to 5 years ago where we see the breakdown of their relationship. When Eiling leaves, we see Wells approach a cage labeled Grodd where he tells him that he has big plans for what seems like an ape inside. Gorilla Grodd is a significant Flash villain so it will be interesting to see what the show does with him. It seems the show is definitely stuffing every single Flash villain or DC villain in the show that I am afraid they are going to run out.